The ISA Slots are shown in Green in image to the right. This is the oldest slot type that is still available today. Computers with ISA slots are no longer available from major computer manufacturers, Ram PC Systems still sells industrial class systems with ISA slots. PCI slots were the replacment for ISA slots. 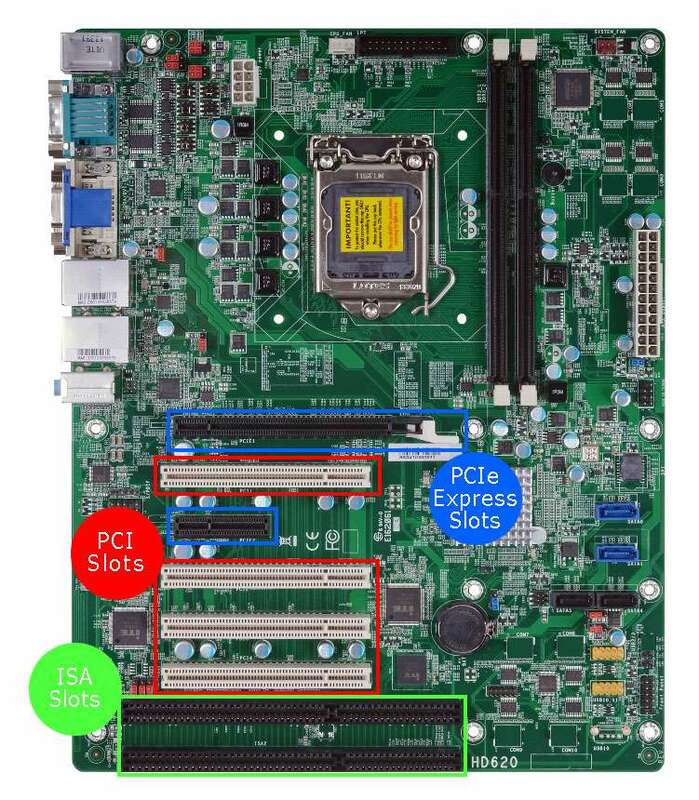 The PCI Slots are shown in the Red box in the image. PCI slots come in several different versions including 5 volt and 3.3 volt slots, and 32-bit and 64-bit PCI-X slots. PCI slots are going away as well but are still available from some major computer manufacturers but they usually only offer one PCI slot. Ram PC Systems has several different systems available with 2 or more PCI slots. PCI Express slots are the replacement for PCI slots, and also AGP (used only for video cards). PCI Express, also labeled as PCIe come in numerous bus widths labeled: x1, x2, x4, x8, and x16.